Foldable phones are cool because they can fit a larger screen in your pocket. But what if the phone doesn’t have to go in the pocket at all – what if you could fold it around your wrist and wear it like a bracelet? ZTE’s nubia brand has made that “if” a reality with the nubia Alpha (also styled as nubia α). 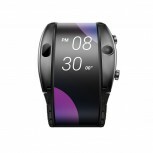 It’s a smartwatch with a 4” flexible OLED screen, produced in a collaboration with Visionox. Since it aims for a watch form factor, the screen is relatively narrow and quite tall – its aspect ratio is 36:9 (960 x 192px resolution). 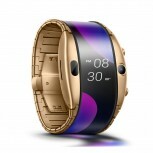 This is indeed a smartwatch, it’s powered by the Snapdragon Wear 2100 chipset with 1GB of RAM and 8GB storage (“enough for 1,000 songs” they say). It runs a custom OS and features motion gestures, AIM (Air Interaction Mechanics). The 500mAh battery promises a day or two of endurance, comparable to smartphones. But it’s a phone too, the eSIM version has voice calling and 4G LTE connectivity. 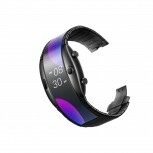 The other version of this foldable smartwatch connects to your phone over Bluetooth and to the Internet over Wi-Fi. If you do decide to go phone-less, you can use the 5MP camera (f/2.2) for video calls and taking photos. Just rotate your wrist to point the camera the right way, there’s plenty of screen real estate to move the viewfinder and keep it in view. The nubia Alpha is built out of stainless steel, the display is coated in heat-resistant polyimide. 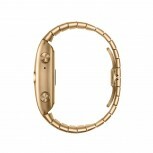 The Gold version of the watch is plated with 18K gold. Both versions are water resistant. 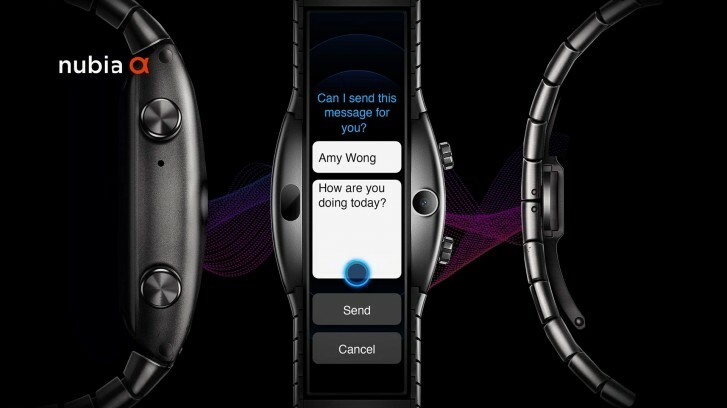 The Alpha features the usual fitness functions you'd expect from a smartwatch. It has a heart rate monitor and can track your sleep. The Bluetooth version of the nubia Alpha will launch in April and it will cost €450, available only in Black. The eSIM model will be €550, €650 if you want the Gold version. China Unicom gets it first (in April), then Europe (in Q3) and North America (Q4). If you are going for a run, you may want to take the nubia Pods along – the new truly wireless earbuds. These will be €100 and will be available globally starting in April. O God I'm really in a wrong profession... Everything I imagined years ago, companies are starting to make today. I always had this idea. BTW, with better specs in mind than this.